Hello from cold, windy, rainy Kamloops. Yesterday afternoon’s beautiful sunshine was gone by this morning, giving way to the October like weather we’ve been experiencing here. Oh well, at least it’s supposed to be nice for the folks coming out for Fan Fest tomorrow. There wasn’t much to report yesterday, the morning practice was spirited, the afternoon was a walk through session with no pads, so I took the the day off from blogging, but did post a few pictures, if you missed them. This morning’s session in the rain was a productive one, but could also have costly. Jon Hameister-Ries left practice on a cart with what looked to be a lower body injury. N o, I won’t get into specifics here, because the club doesn’t appreciate that, but you can probably use your imagination. He did not return to the field. That would make three potential offensive lineman now nursing injuries, meaning guard Patrick Kabongo should have no problem dropping a few pounds. Club president Dennis Skulsky told me this morning that Dean Valli will go to Vancouver on Tuesday to have his knee evaluated by doctors, and said the club will take its time on the return of both he and Jesse Newman. Rookie Matt Norman has shown well. Khalif Mitchell also took the pads off, favouring his upper body, but it looked like he would be fine after being worked on by the trainers. Running back Stu Foord had a good morning session, earning the praise of coach Kelly Bates and showing his talents in the mini scrimmage potion of practice. Travis Lulay looked sharp and backup Mike Reilly, perhaps coming to life after the release of Corey Leonard also looked sharper this morning. Receiver Kierrie Johnson continued his strong showing in camp, and any thoughts that his roster spot might be in jeopardy are starting to fade if they haven’t already been extinguished. 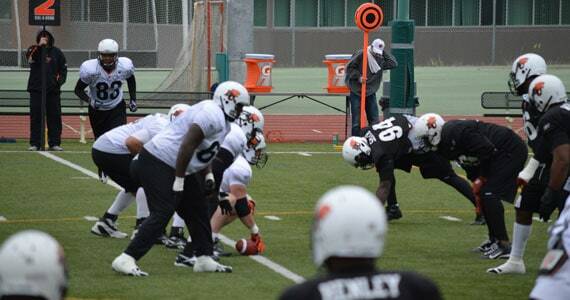 Defensive line hopefully Maurice Evans returned to practice this morning as did receiver Marco Iannuzzi. Time for lunch, hopefully warmer, drier skies await for the afternoon session at 4:00pm today. If you’re in Kamloops and would like to join us for a little BC Lions Social at Boston Pizza tonight, we’ll be gathering at 7:30pm at the 500 Notre Dame Drive location. Drop me an e-mail or send me a tweet @BCLionsDen if you’re thinking of joining us so I can ensure we have a seat waiting for you!